Fermanagh manager Rory Gallagher reacts. 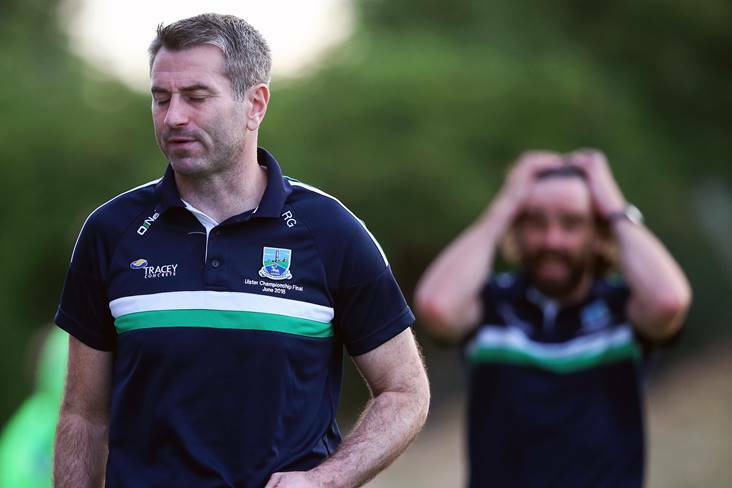 Work for the 2019 campaign starts now for Fermanagh manager Rory Gallagher as he looks to unearth new talent. The Erne County's year came to an end last Saturday evening when Kildare ran out comfortable winners in their All-Ireland SFC round four qualifier clash at Pairc Tailteann, Navan. It brought the curtain down on a good year for Ulster men as they gained promotion to Division Two and reached the provincial final. For the players, they will now return to their clubs, but for Gallagher and the rest of his management team, they will be trawling the net for new talent during the club championships. "Yes we will get out to see all the championship games and will be keeping an eye on all players," stated Gallagher. "The Fermanagh u20s had a good squad this year and I hope a number of these players can now push on to county senior level as well."